The validation of a unique approach to visual analytics. 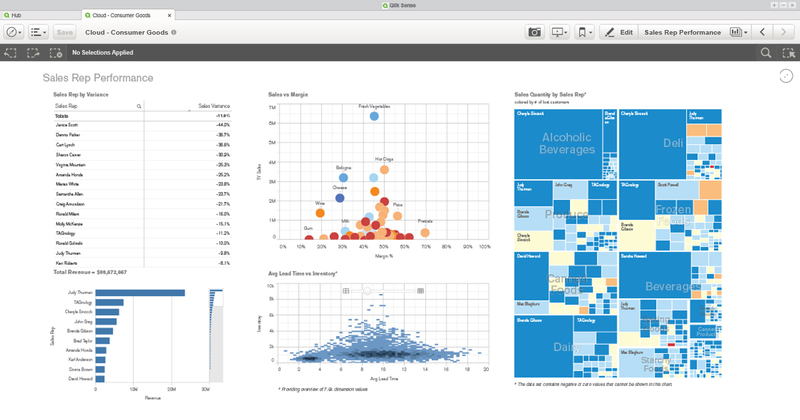 Back in June I shared the exciting news that we had made Qlik Sense 2.0 generally available which introduced a number of new features including self-service data preparation, smart data compression, Qlik DataMarket and which highlighted the full range of visual analytics use cases our new platform approach now enables for business users, IT and the developer community. Qlik Sense 2.0 also represented a significant milestone in our product lifecycle as not only did it once again underline our commitment to deliver 3 regular updates per year to our Qlik Sense product family, it also demonstrated the confidence Qlik, our partners and customers have in the maturity our visual analytics platform. This maturity was recently discussed in a new report published by Gartner Inc., Qlik Releases Qlik Sense 2.0, Expands BI Portfolio*, in which analyst Cindi Howsonexamines the capabilities of Qlik Sense 2.0, assess its impact on the market and makes a number of recommendations for customers and prospects considering evaluating new analytic solutions. Anyone that knows Cindi knows she has an eye for detail and there is far too much content in this 15 page report to include here so instead we have licensed a full copy of the report for you to read at your leisure. I hope after reading the report, you, like I, take this as one validation of our platform strategy with respect to Qlik Sense, but of course customers voting with their feet are another and since my blog on 2.0 we’ve seen numerous high profile customers publicly share why they selected Qlik as their visual analytics platform. For example, Housing.com, one of the fastest growing real estate platforms in India, benefits from Qlik’s ease of use and intuitive visual analytics capabilities to helping their customers to have a smooth and effortless experience in finding their dream homes. AFAS Software, a fast-growing ERP software provider, will integrate Qlik Sense into its online product to provide world-class visual analytics to more than 560,000 users. As an additional reference point, Gartner also published a further report Survey Analysis: Customers Rate Their Business Intelligence Platform Ownership Cost, ** looking at how customers rated their business intelligence applications cost of ownership. The report examines over 20 vendors in the market including so called “megavendors”, data discovery and cloud BI solutions. I personally believe that this report is yet another great validation of our approach. There is of course much more including many additional user experience features and new Qlik DataMarket Topical Packages and to find out more about these check our Mike Tarallo’s latest video on Qlik Sense 2.1. Now if a new release, backed up great analyst and customer validation is not a compelling enough reason to get your visual analytics strategy in play, the our Consulting Services team can help with their new Qlik Sense Fast Start offering a team of skilled professionals to ensure that your business and IT teams can rapidly and confidently deliver your first Qlik Sense applications, optimized for your business and which drives rapid user adoption. So… what are you waiting for? * Source: Gartner, Qlik Releases Qlik Sense 2.0, Expands BI Portfolio, Cindi Howson, August 17, 2015. ** Source: Gartner, Survey Analysis: Customers Rate Their Business Intelligence Platform Ownership Cost, Rita L. Sallam et al, August 27, 2015.